This study was designed to assess the effects of Dietary Approaches to Stop Hypertension (DASH) eating plan on insulin resistance and serum hs-CRP in overweight and obese women with PCOS. 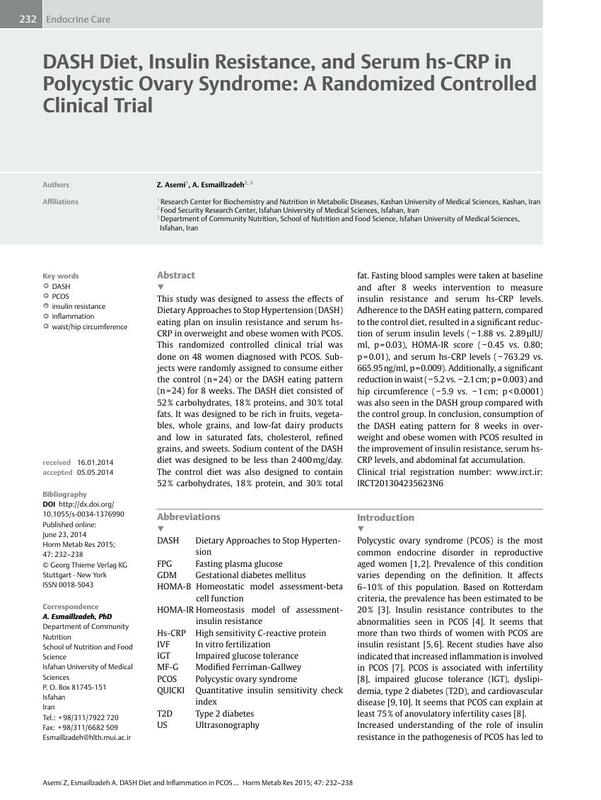 This randomized controlled clinical trial was done on 48 women diagnosed with PCOS. Subjects were randomly assigned to consume either the control (n=24) or the DASH eating pattern (n=24) for 8 weeks. The DASH diet consisted of 52% carbohydrates, 18% proteins, and 30% total fats. It was designed to be rich in fruits, vegetables, whole grains, and low-fat dairy products and low in saturated fats, cholesterol, refined grains, and sweets. Sodium content of the DASH diet was designed to be less than 2 400 mg/day. The control diet was also designed to contain 52% carbohydrates, 18% protein, and 30% total fat. Fasting blood samples were taken at baseline and after 8 weeks intervention to measure ­insulin resistance and serum hs-CRP levels. ­Adherence to the DASH eating pattern, compared to the ­control diet, resulted in a significant reduction of serum insulin levels (−1.88 vs. 2.89 μIU/ml, p=0.03), HOMA-IR score (−0.45 vs. 0.80; p=0.01), and serum hs-CRP levels (−763.29 vs. 665.95 ng/ml, p=0.009). Additionally, a significant reduction in waist (−5.2 vs. −2.1 cm; p=0.003) and hip circumference (−5.9 vs. −1 cm; p<0.0001) was also seen in the DASH group compared with the control group. In conclusion, consumption of the DASH eating pattern for 8 weeks in overweight and obese women with PCOS resulted in the improvement of insulin resistance, serum hs-CRP levels, and abdominal fat accumulation.